Explain Why? Event Printer with Chrome on Windows requires an Extension to start. Please install extension, or visit with IE. Raffle Printer with Firefox on Windows requires an Extension to start. Please install extension, or visit with IE. Event Printer requires Windows with Internet Explorer, Edge or Chrome with extension to run. 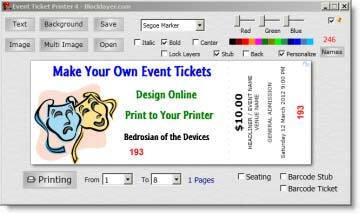 Got an idea for improvements or new additions to this Event Ticket Printer? Check the Pin checkbox to keep the designer visible while you read and navigate the instructions on this site. Click on stub to rotate text horizontal for easier editing. Click again to rotate back to vertical. The stub will auto rotate to vertical on printing, if you leave it rotated. You can add or remove the stub entirely with the 'Stub' Check-box. If you uncheck the stub box, you can edit the entire surface of the ticket. 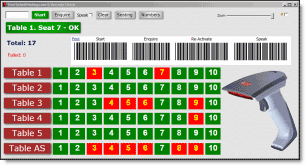 Mouse over the stub area to highlight the Header and Body editable areas of the stub. Edit or add Header and Body fields etc by directly over-typing. With mouse pointer over stub Header or Body area, Mouse-Wheel to re-size, change font with dropdown selector, or change color with color bar or sliders. If you add a Barcode to the ticket stub, it will reduce the height of the stub body text, and may overwrite existing text. Check the 'Barcode Stub' checkbox to add the barcode. If you're using Windows 10 and the print file (.XPS) won't open, you'll need to re-install the XPS Viewer app. Click on Apps then Click Apps & features. Under "Apps & features" click Manage optional features. Click the Add a feature button. With Windows 10, you can convert the XPS Print File to PDF. Open the XPS file, choose Print from the File Menu, then choose Windows Print to PDF as the Select Printer option.